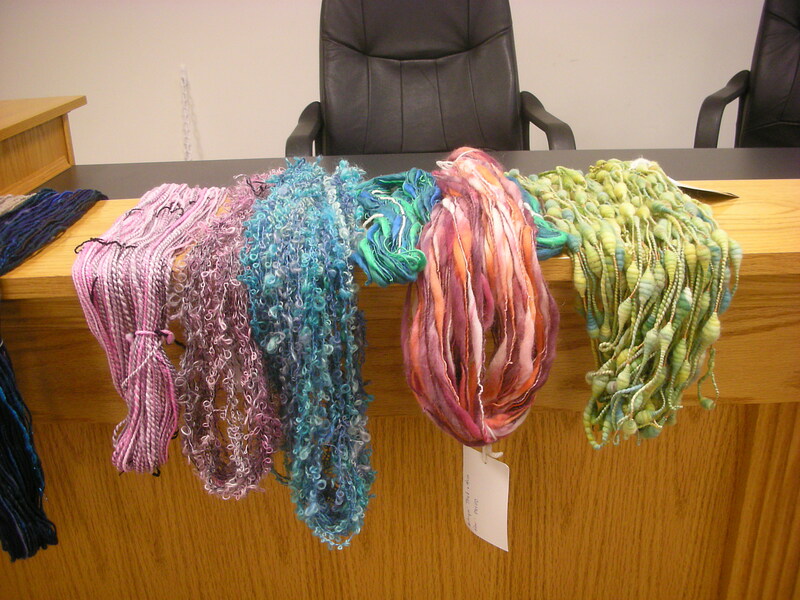 I’ve had quite a summer of natural dyeing. 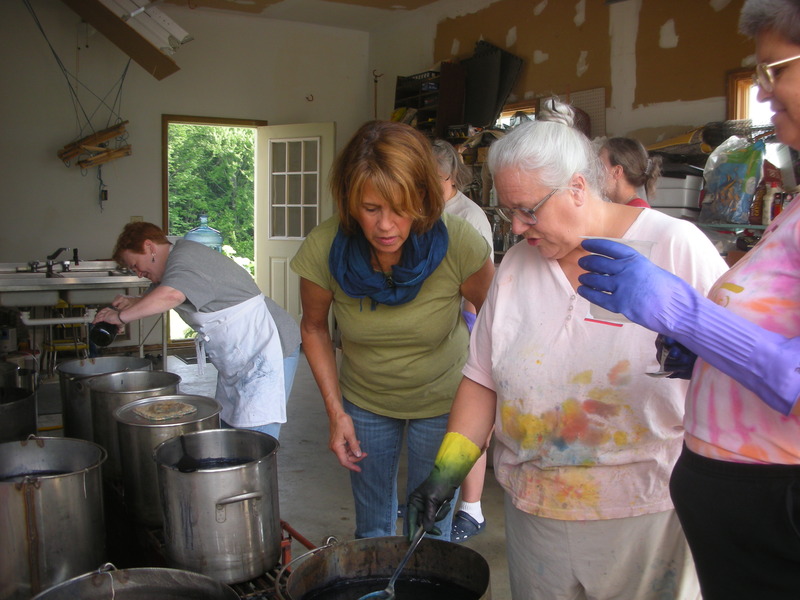 In June, Nancy Zeller of Long Ridge Farm in New Hampshire conducted a 2-day workshop for my guild on Indigo Dyeing. It was wonderful! 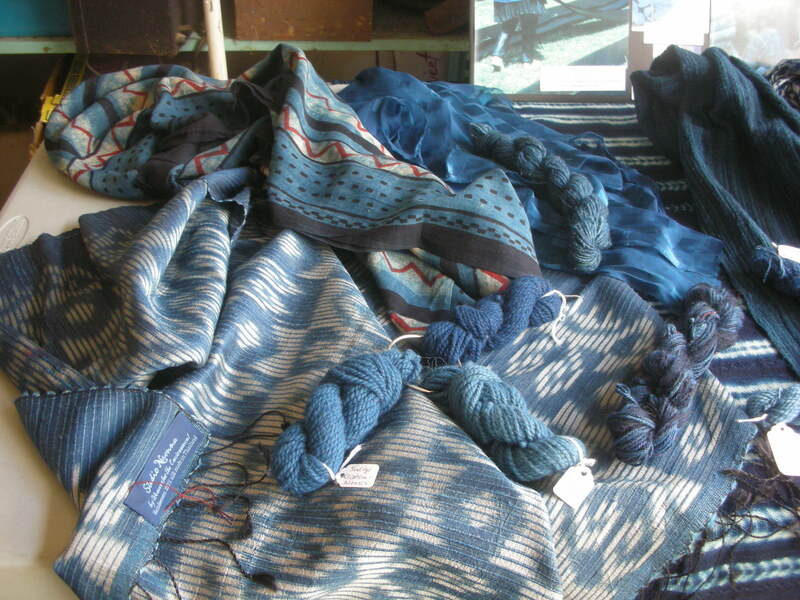 First she brought samples of indigo dyed textiles. Then we got to work creating our vats. Nancy inspected Karen and Betsy’s vat to make sure it had the proper pH, temperature, and low oxidation. My partner Amanda, a biology professor (lucky me) and I had a great time working together at the workshop. She was very adept at using pH paper and understanding the reading. Before the workshop, I took some cotton gauze fabric and shibori stitched it all over. 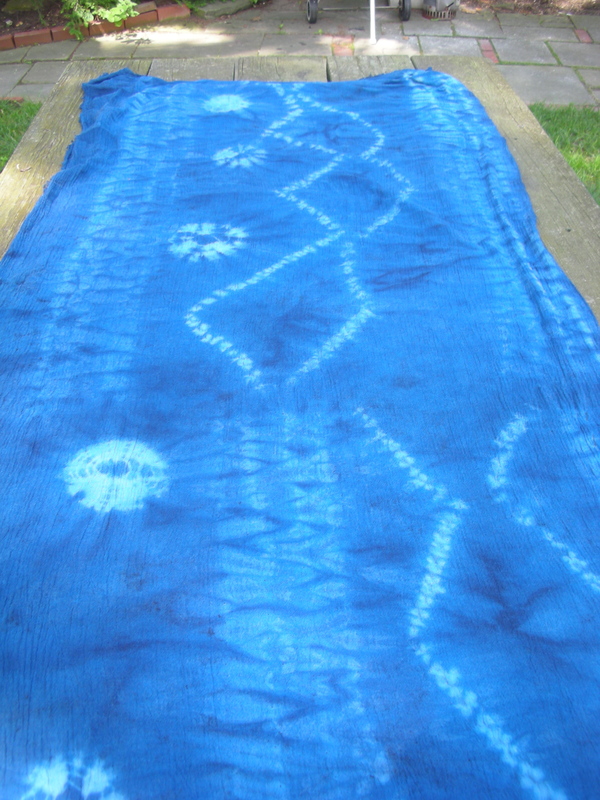 I got some great results after I dyed it in indigo and then after removing the stitching, dipped it in a woad vat (another blue dye we got to play with). I was pleased. Indigo was magic. I came home with enough of a vat to reinvigorate it and dye some more. In the meantime, I spent this last weekend experimenting with the lovely yellow dyes of Queen Anne’s lace. More about that in the next post. I’ve been on a learning binge lately which has been fun. 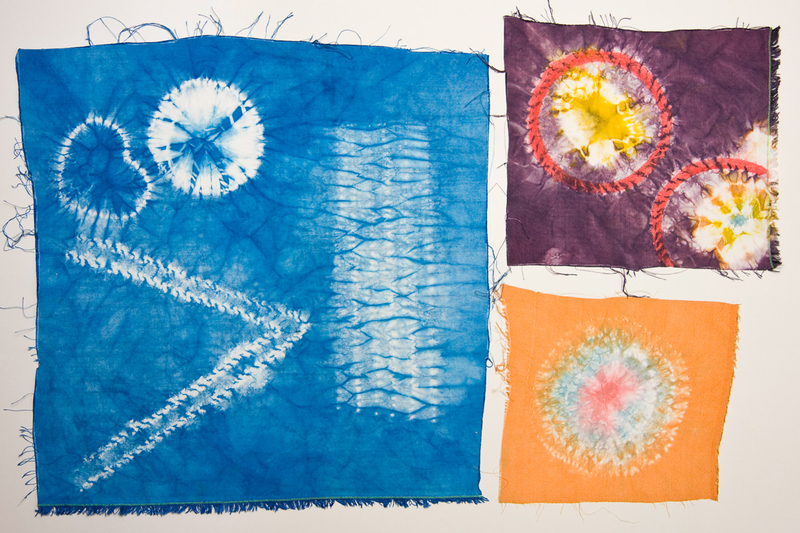 Recently I signed up for an on-line class in Shibori techniques. 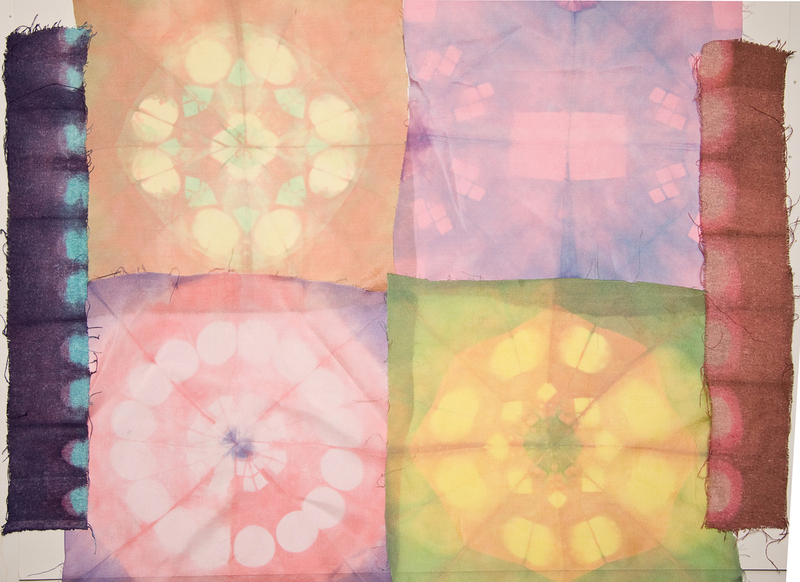 I’ve done some woven shibori in the past, but never the traditional techniques on silk. I’m in the second week of a 5-week session and it’s been a blast. Not only is Glennis a wonderful teacher, the class of people from all over the world has been enthusiastic and very creative. Glennis designed the on-line class to be a weekly uploaded teaching pdf document with embedded videos and a blog where we all share ideas. The first class was about using clamped resists on silk samples using ColorHue Dyes. I wasn’t thrilled with the pale results. The itajime technique was difficult for me with all the clamps and shapes, but fun nonetheless. 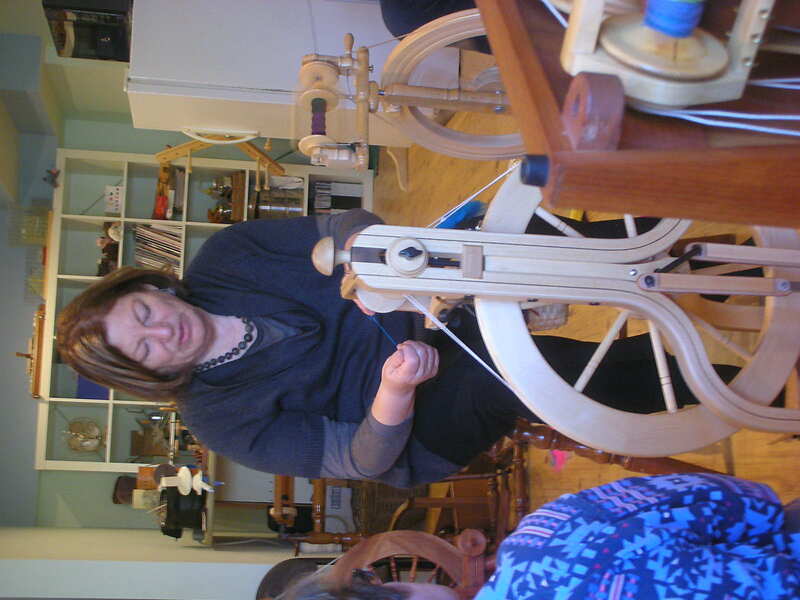 Last week in Lesson 2, Glennis introduced three different techniques using hand stitching–mokume (rows of running stitches, similar to woven shibori), makiage (pattern within a motif), and orinui (overcast stitching on a fold). This was more my style. I love to sew, these techniques give me much more control, and an additional video gave me much more information on how to increase the intensity of the color. The photos show the initial stitching, everything gathered and dyed, and the unveiling which I’m crazy about! I’m very pleased that the color was so intense. 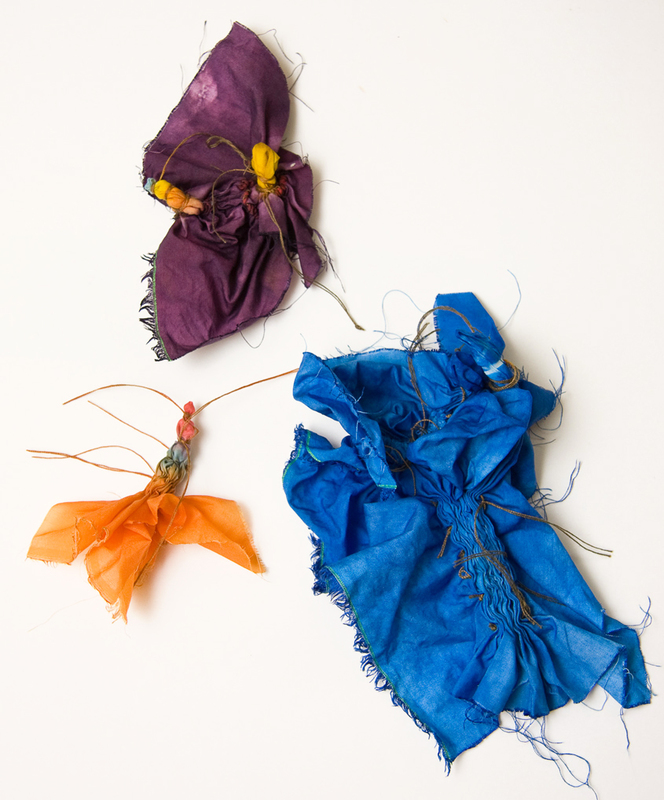 The blue sample was simply dyed, but the other two were immersed up to a point and the rest of was painted. Fascinating how it all works. 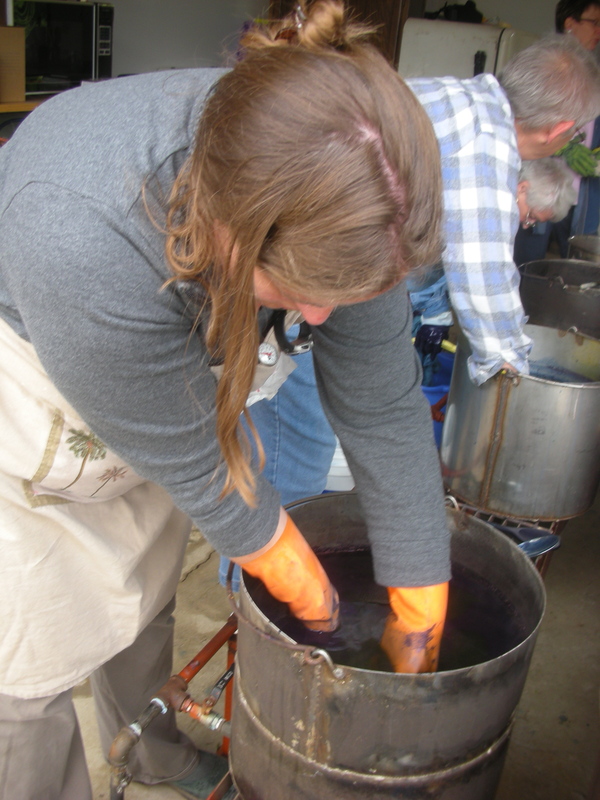 This summer I’ll be attended an indigo dye workshop and I’m sure I’ll be bringing plenty of work from the techniques I learn over the next few weeks to place in the dye pot. I will continue to post with each new technique learned. Stay tuned. Goodness. I’m embarrassed that it’s been so long since I visited with you. The holidays, work, and a variety of factors kept me away from Between the Threads for over a month. But I’m back with some nice projects to show for it. 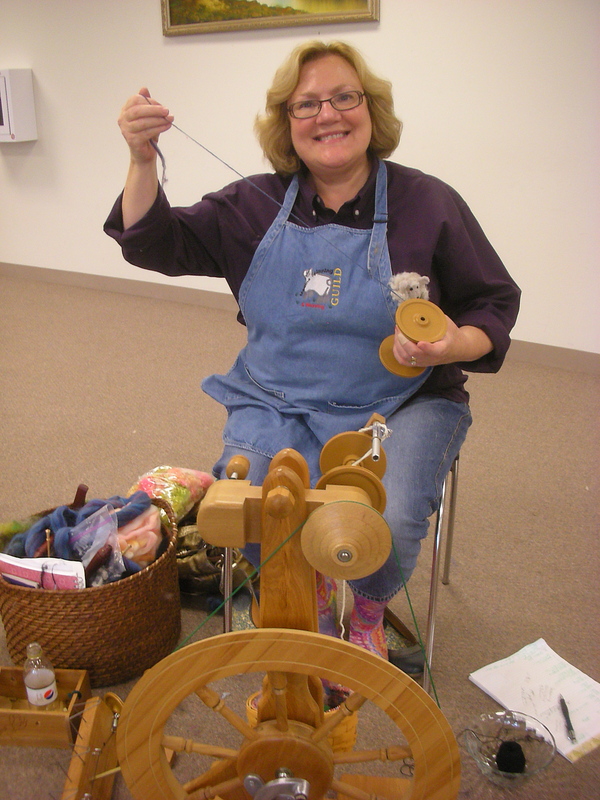 During October, I spent some time at the loom weaving up 5 yards of material from Harrisville Shetland Wool cones. 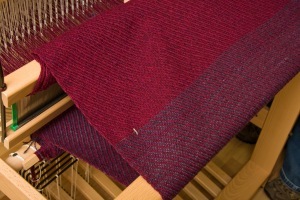 It was a very nice twill structure and I used some handspun for a contrast. 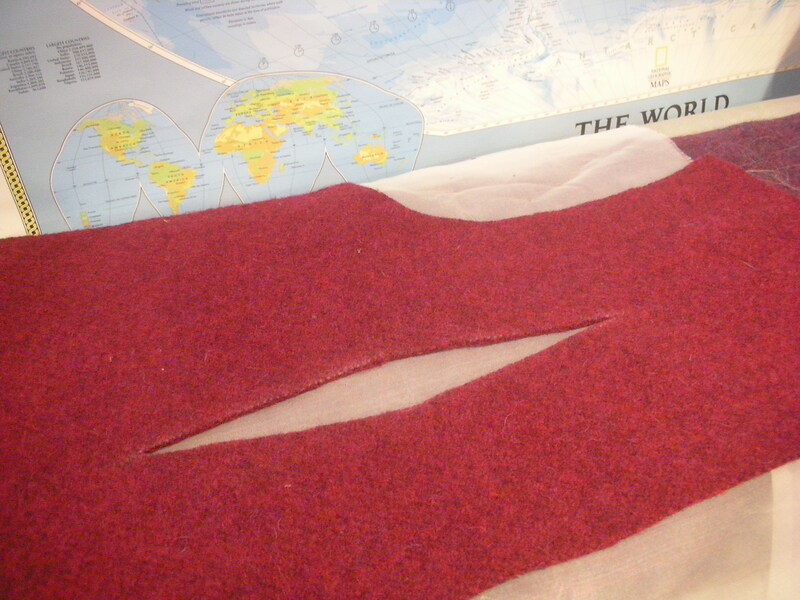 Then I decided to full the fabric as I prepared to make a coat. I threw it into the washer on hot, just for a few minutes. And then…. uh, I got distracted by my daughter who “needed to talk.” Let’s just say that when I ran frantically to the washing machine to pull the fabric, it was felted beyond belief. It was toast! 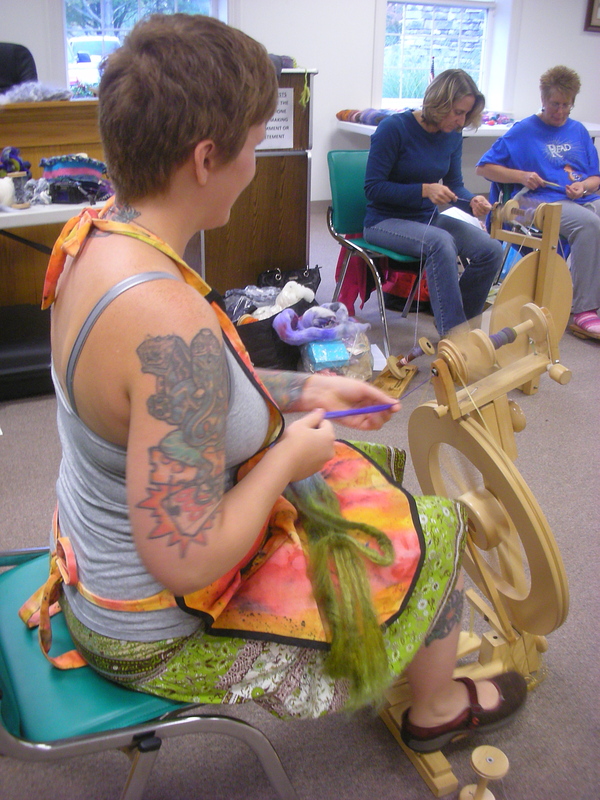 The part with the purple handspun was thick enough to use for a horse blanket. Weave structure- gone! The magenta part at the top of the picture brightened considerably, but shrunk significantly so that a coat was out of the question. Time to make lemonade:) I needed a new purpose. The purple accent fabric was cut off, doubled over, and now makes a nice surface for pressing on my ironing board. Then I went to a workshop one night at my local, independent fabric shop. 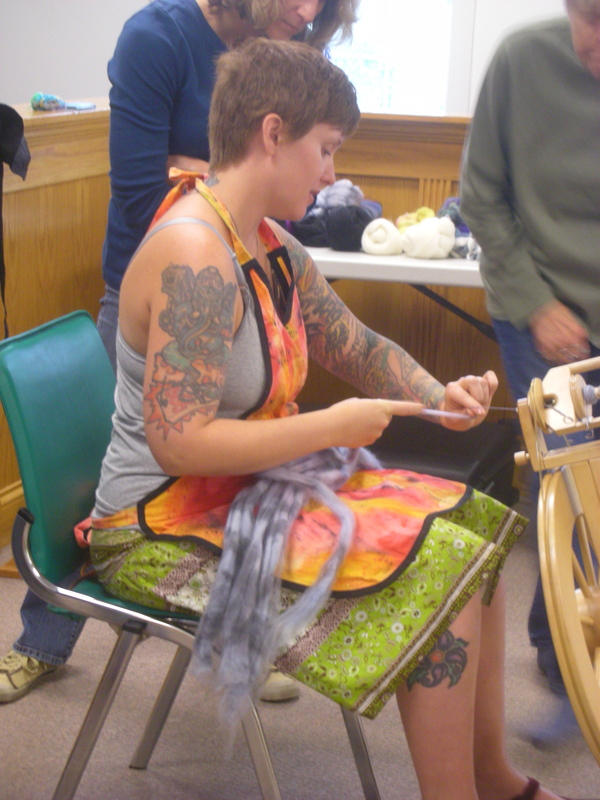 It was all about working with wool. I raised my hand. “Anyone have any suggestions for a this?” I told my story and got ideas for a vest. I’m not a big vest person. They tend to look boxy on my short body. 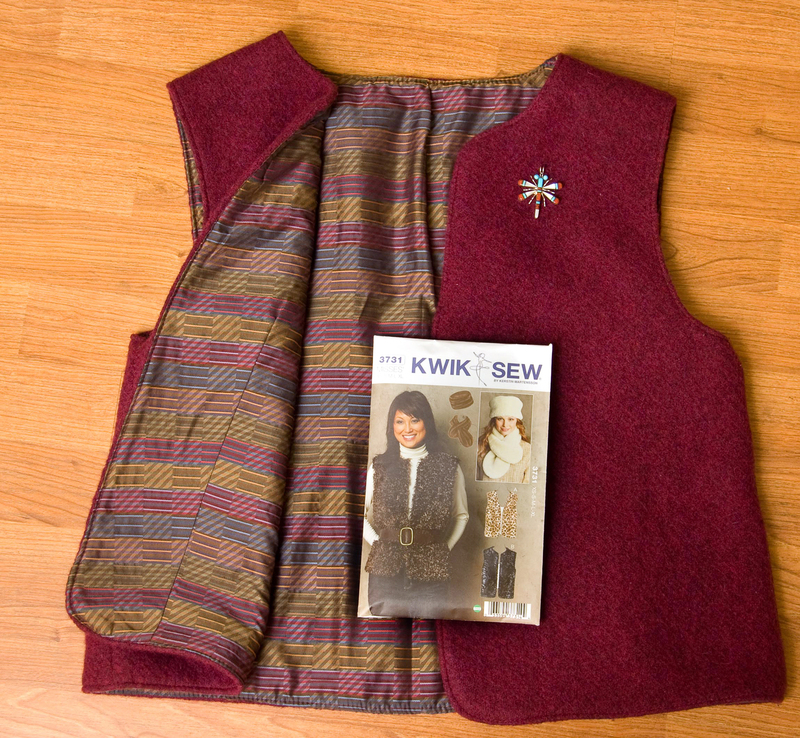 But with little else to use it for, I got a nice pattern from Kwik Sew and set about making a vest. The first order of business was making something flattering out of a thick wool felt. It was all about reducing bulk. 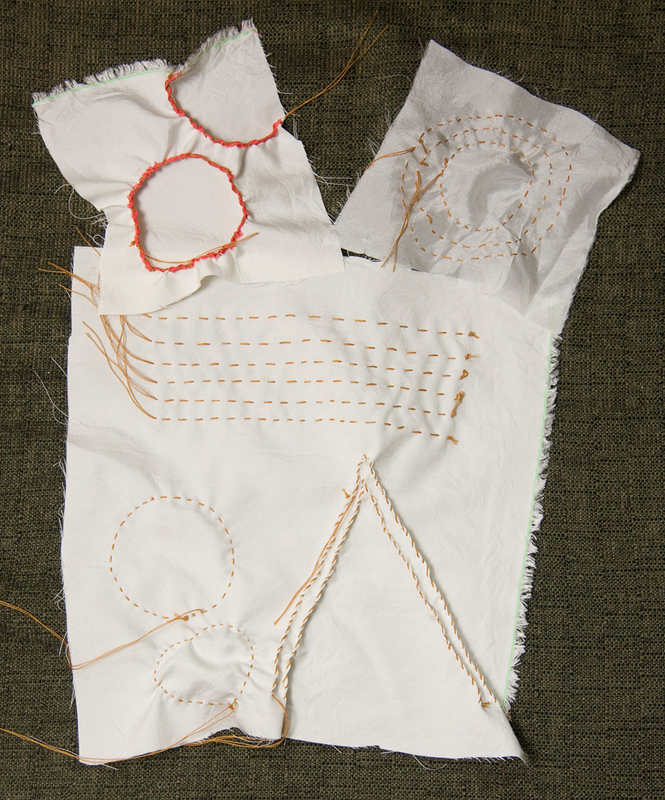 I spent hours carefully fitting the pattern with added darts in the front and back and using ideas from Sandra Betzina on working with boiled wool. In this picture, you can see one of the back pieces. I used a diamond shaped dart to create shape, but instead of cinching the fabric together like a traditional dart, I cut out all the fabric. I did this because Sandra says it takes out all the bulk. It worked beautifully when I pressed the edges together and zig-zagged the seam after backing it with fusible interfacing. You can’t even see the seam on the right side of the vest. The thread is buried in the felt. It was a cool trick. 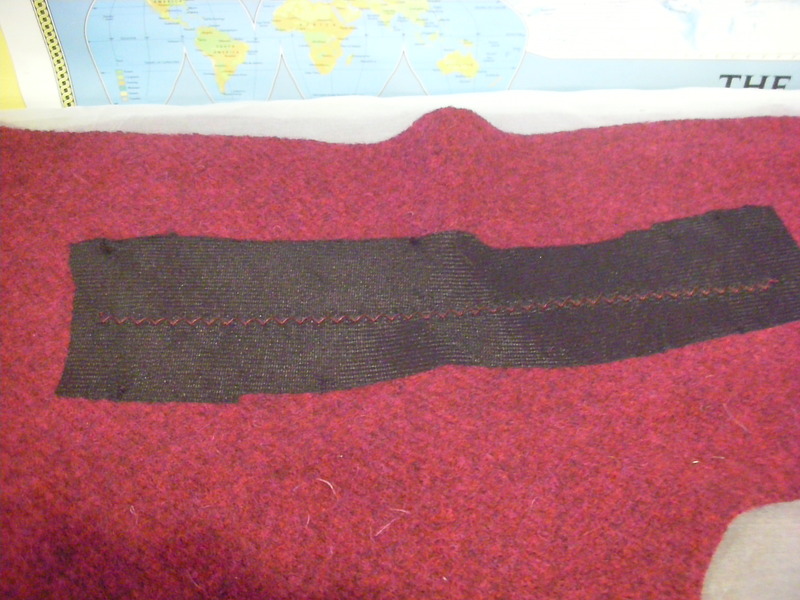 Well, I eventually finished the vest before the holidays by putting a nice lining in it. 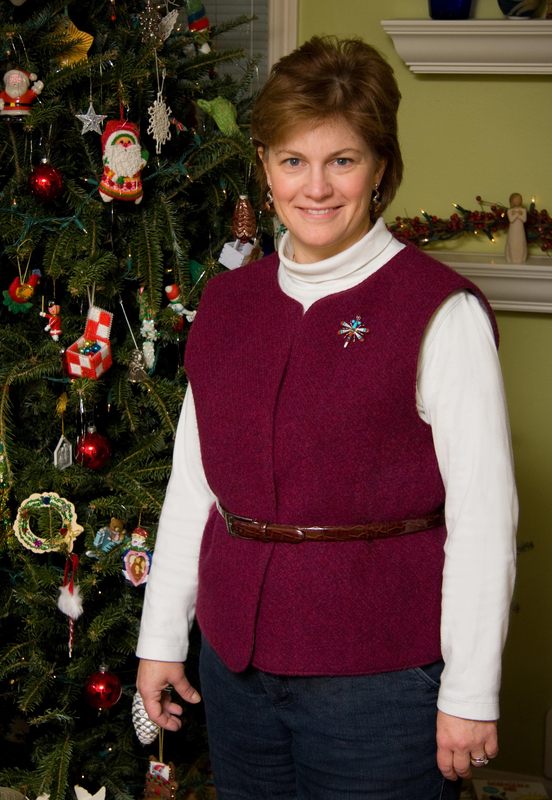 And I wore it for Christmas, adding earrings and a pin my husband gave me that morning which he had picked out specifically for the vest. Tim Gunn always says, “Make it work.” I think, this time, I did.